Valcucine’s Invitrum finalist at the AZ Awards 2011: thanks for voting us! About 600 entries across 25 countries were submitted to Azure’s AZ AWARDS 2011, the magazine’s first annual international competition recognizing excellence in design. Of these submissions, international experts – Claude Cormier of Claude Cormier Landscape Architects, Craig Dykers of Snøhetta, product designer Patty Johnson, Eero Koivisto of Claesson Koivisto Rune and Glenn Pushelberg of Yabu Pushelberg – have chosen the finalists and winners. We are proud to announce that Valcucine’s Invitrum Base System was chosen as finalist for the category Furniture Systems. Thanks for voting and supporting us! On June 16 the winners selected by the jury and the public will be announced during a private ceremony and exhibition at Toronto’s Harbourfront Centre. All winners and finalists will be featured in Azure’s Awards Annual on newsstands in June. The AZ AWARDS private ceremony and exhibition opening will take place June 16 at Harbourfront Centre in Toronto. The AZ AWARDS winners exhibition will be open to the public June 18 to September 25. The days on which the “Salone del Mobile” furniture exhibition in Milan is held are the busiest of the year. In our agenda, events and openings intertwine with normal daily commitments preventing us from paying all the visits we would like. Nevertheless, this time it will be almost impossible to miss at least one visit to the Brera Design District where Valcucine offers a very special service to professionals of the sector and inquisitive passers-by. 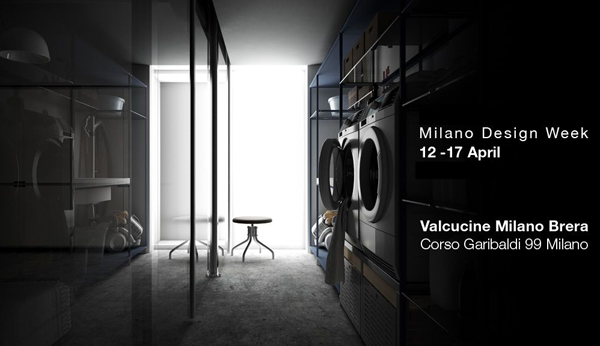 Valcucine Temporary Laundry is the free laundry and ironing service that Valcucine makes available to design lovers during the “Salone del Mobile” exhibition. From Monday 11th to Sunday 17th April anyone who has signed-in on the web can bring his/her dirty laundry to the Valcucine Showroom in Corso Garibaldi 99, in Brera and pick it up during the afternoon of the next day. There is only one restriction: the garments must be white. This service will be offered with the collaboration of AEG, a worldwide leader in the washing machine sector, for as much as regards the technical information, and with Mammeacrobate who will give a live report on the experience and who will collaborate with us to run the laundry. As well as being a local service, Valcucine Temporary Laundry also launches a global product: Valcucine’s Laundry line that will soon beautify the laundry area of homes worldwide with its design, functionality and with its ergonomic solutions. We are glad to announce a new concept of living spaces for the home. Valcucine declares its way of conceiving, interpreting and furnishing spaces by widening its horizons beyond the kitchen. An evolved environment made of varying geometric shapes directed towards newer and greater possibilities of use. One of the tangible signs of our changing times, the living room area, now more than ever truthfully and naturally represents the evolution of people’s lifestyles. All things change. This is also true of the living room area that is now more open, flowing, offering furnishing ideas that replace the walls and are capable of dividing spaces in a harmonious way without shutting them off completely. The key word is “open space” no matter whether the environment is large or small; smaller ones, in fact, become more luminous and versatile. The kitchen is traditionally the room that demands more advanced standards in terms of materials and technical solutions. Valcucine is now transposing thirty years of this know-how and experience into furniture for the living room. VALCUCINE LIVING means functionality. It is a modular and customisable system for the living room and the home office distinguished by a clean and linear design, in which the material is the star and is extolled without ever perverting its nature: the warmth and textured appeal of the solid wood used for the chairs, benches and bookcases is combined with the elegance of glass and of aluminium. A programme consisting in storage units, wall panels with shelves or glass display units, bookcases and shelving units, tops and wall-hung or floor-standing benches designed to be used as a versatile system of practical seats every day and in the most natural of ways. There are many patents covering the exclusive solutions used in the VALCUCINE LIVING programmes which also comply with the high safety standards certified by the German GS quality mark. All the products are distinguished by their ergonomics and practicality of use; large pullout sliding doors, interior wiring for concealed electrical connections, high technology integrated and hidden away in the furniture as well as utmost freedom of arrangement for the single elements, even in height. Moreover, all the furniture, even the parts in glass, have been reinforced so that they can be used as practical benches to sit on in perfect ease. The VALCUCINE LIVING programme also expresses a deep awareness of the tactile beauty of materials: it wants to recover our senses so that Man can “listen” to the texture of surfaces through his fingers. It uses innovative and environmentally friendly materials such as glass and aluminium together with more traditional ones such as solid wood. It upholds ecological values: dematerialisation contributes to saving energy and raw materials. It uses original patents and advanced technologies while guaranteeing its focus on ergonomics, safety and consumer health. The result is the story of a place, a living room space that is dynamic, lively yet tidy, elegant and creative, made of essential things with just a touch of luxury and in which the VALCUCINE LIVING systems are the absolute stars. A carefree and practical space where you can spend time with your friends, play with the children, relax, read, work…. simply live. Now discover the CATALOGUE and watch the TRAILER!